Lately, I’ve been playing some brain games from Lumosity.com. I like the one that challenges me to look at things differently in order to solve a puzzle. When I try to solve it from my narrow perspective I lose. But when I open my eyes to a new direction, suddenly the solution appears, and is so easy that I wonder how I didn’t see it before. The Magi were great at that. They were probably Persians, searching the skies for astrological signs, when they saw this compelling Star, and were so drawn to it that they left everything to follow it for two years. And where did it lead them? Far away, into the heart of Jerusalem. 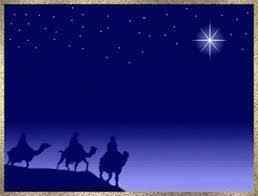 That must be why they surmised that the star was announcing the newborn king of the Jews. Talk about openness. They weren’t Hebrews, but were willing to change the direction of their lives in order to find this Jewish King and pay him homage. Then, overjoyed at finding him in Bethlehem, they paid attention to their dreams and changed directions again, going back home another way in order to give the Holy Family a head start in their flight away from Herod and into Egypt. Thirty-three years later, the orthodox, Law-abiding Saul of Tarsus encountered that same Jesus, now risen and ascended, as a Light whose blinding brilliance stopped him in his tracks. He left the road to Damascus and changed the direction of his life, and thus the direction of the history of the world. Are you looking for a new path for your life? 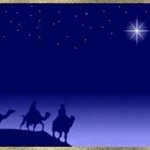 Ask him whose birth was heralded by a Star to shine the Light in your direction. What dead-ends do you want to stop following this year?